The main screen of the program is where you can see all of the messages you have configured. From here you can create new messages, edit, delete or preview the highlighted message. 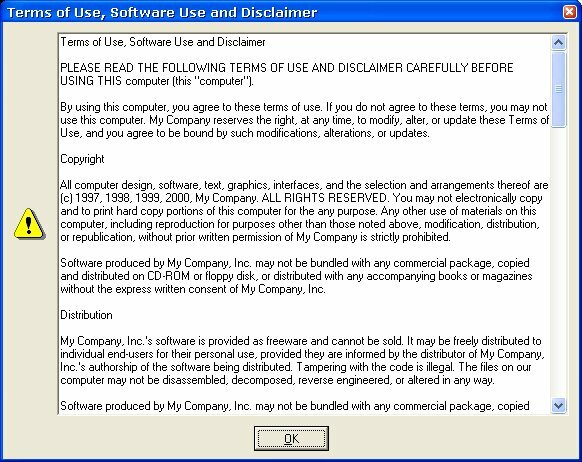 When you edit or add a new message, you will be presented with this screen. From here you can specify the name of the message and its location. This location will be where this message file is saved. You can define the caption and body of the message. 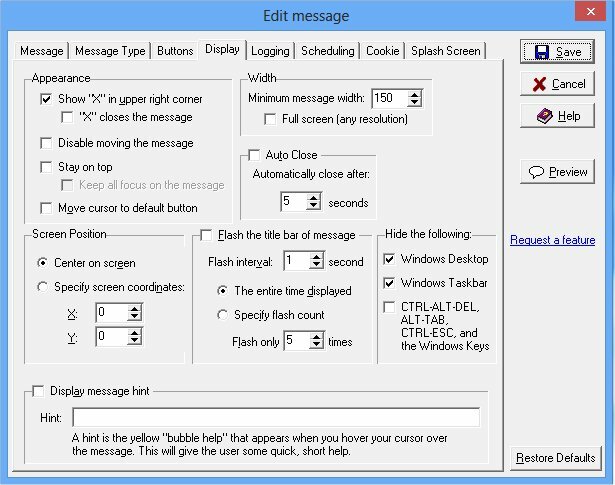 Included with the message body is the MACRO feature. These Macros will allow you to dynamically display specific information about the user who is viewing this message. 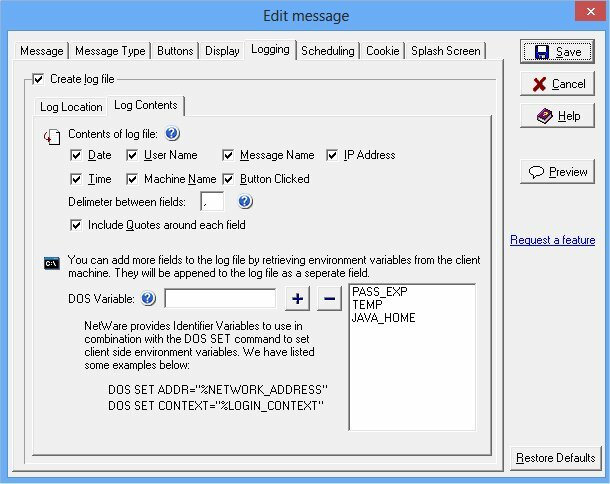 If you wish, the message contents can be loaded from a seperate file that resides on your network. Using this method allows for quick and easy message updates. Additionally you can modify the font and size of the message body text. You can customize the type of message that is displayed to the user. The image type will allow you to display the standard Windows images (Win 9x or Win 3.x style) or any custom image you wish. The custom image will allow for any size image to be displayed to the user. This is great for company logo's or any other type of image you would like to display. You can have one of the machine's Windows Event sounds or a custom sound be played when the message is displayed. The buttons section is our most powerful part of this product. From here you can specify which buttons are displayed on the message. 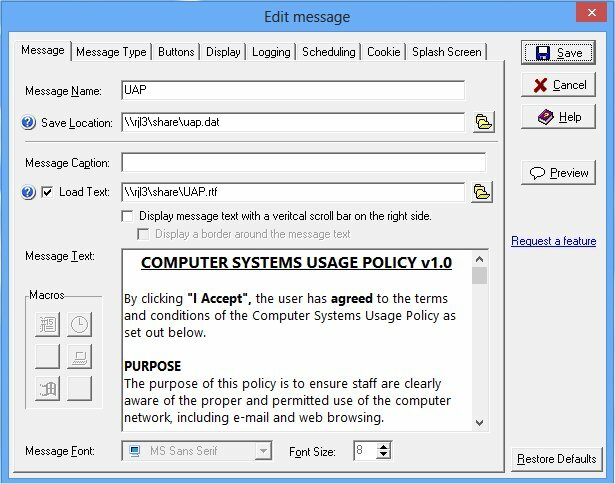 For each button you can configure the text on the button, whether it is the default, the button action, and specific information based on that action. You can set the height and width of the button, font, size and whether or not images can be displayed. Additionally you can determine if the buttons should be enabled as soon as the message is displayed or if you want a delay, the errorlevel returned when the button is clicked and more. 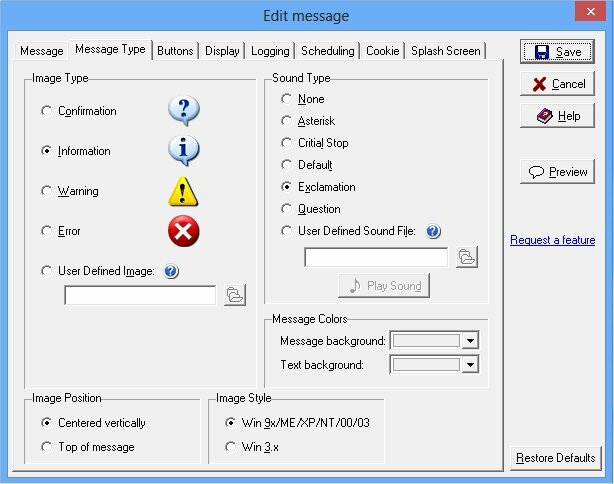 The options allows you to specify unique characteristics about the message being displayed. As you can see from the screen shot above, there are many message options that can be chosen. Logging users interaction with the message is a very important part of this product. If you do not know how the users interacted with the message, you have no way of determining your next course of action. All the information logged is written to a user specified delimited log file, perfect for importing into Access, Excel or any SQL compatible database. 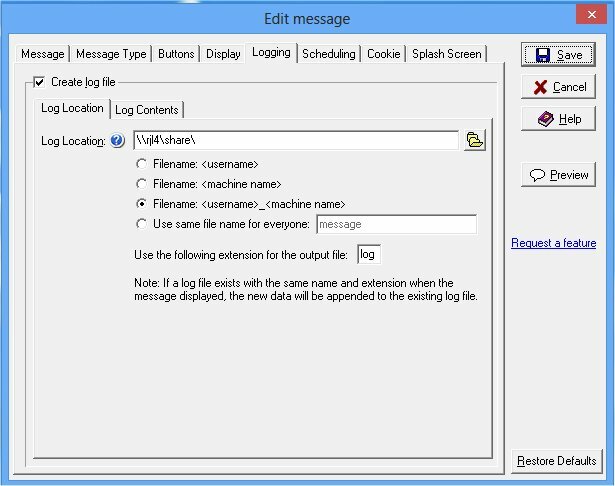 You have the option to write all users respones to one log file or username, machine name log files. 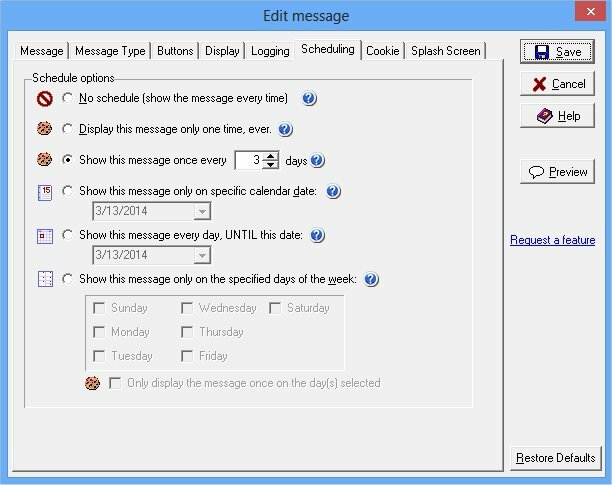 The Schedule feature allows you to specify when the message will be displayed. You can either pick the specific date or the day of the week the message is displayed. This way you can have the message launched every day and it will only show the message when you scheduled to see it. Combining the Schedule feature with the Cookie feature you have a very powerful message utility. 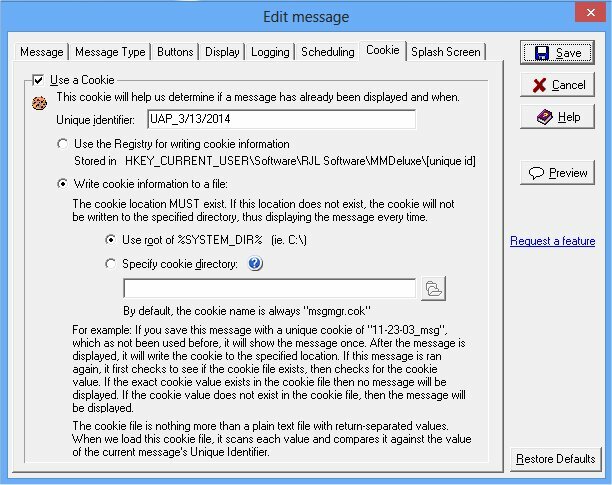 The cookie feature allows you to prevent the same message from being displayed on the same computer more than once. This is perfect for one time messages, such as a usage policy. You can specify the unique ID for the cookie and the location where the cookie file should be stored. Based on all of the screen shots above, this would be the message that would be displayed to the user (or close to this). 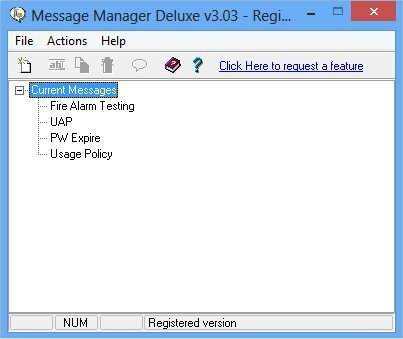 This message shows the ability to load a text file for the contents of the message. This allows for the user to have a scroll bar to read large amounts of text on the screen. There is NO limit to the size of the text file to be displayed. You can also see the message buttons are disabled ensuring users cannot continue until the alloted time has passed. This example has a message that includes the date and time macros. It also shows the ability to configure the display of the message and buttons. This example has a message that shows loading an RTF file from the network server. It also shows a borderless message, white background and the option to display a scrollbar within the message. As you can see, the message you create for your users to see is totally customizable.